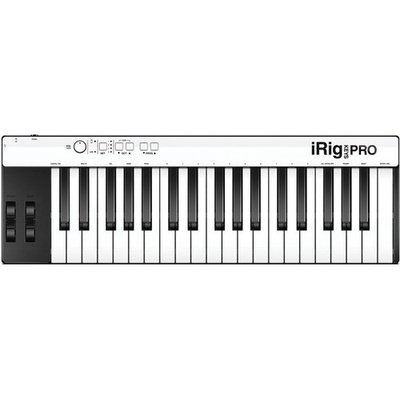 Product #21849 | SKU IP-IRIG-KEYSPRO-IN | 0.0 (no ratings yet) Thanks for your rating! The iRig KEYS PRO 37-Key Controller for iOS from IK Multimedia is a 3-octave, 37 velocity sensitive key controller for Mac, PC, and iOS devices. It supports MIDI, and will work with any compatible virtual instrument. The KEYS PRO has a mini potentiometer as well as octave up and down and program up and down buttons. The controller can be powered by your iOS device, Mac, or PC or via USB. A download code for SampleTank 2 is included along with a 30-pin cable, Lightning cable, and USB cable.